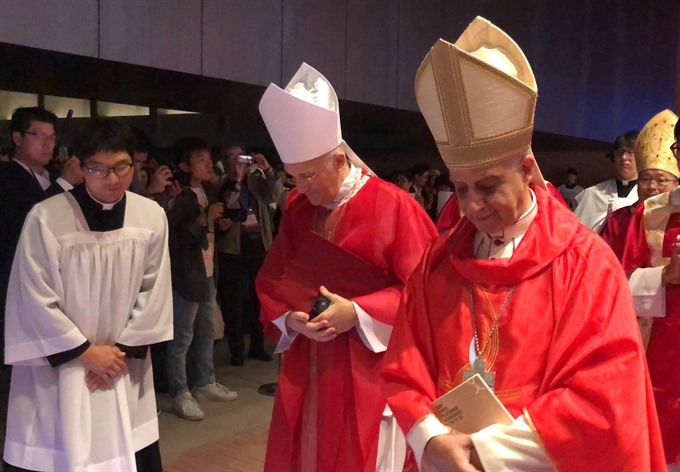 SEOUL — The Seoul Metropolitan Government is committed to promoting the Seoul Catholic Pilgrimage Routes as the Vatican officially bestowed the recognition at a solemn ceremony held on Friday (September 14) at the Seosomun Historic Park in Seoul. The Seoul Catholic Pilgrimage Routes are a 44.1km-long road that starts from Myeongdong Cathedral to reach Samseongsan Holy Ground, which is divided into three routes: the “Route of Word” (Myeongdong Cathedral to Gahoedong Church, 8.7km), the “Route of Life” (Gahoedong Church to Yakhyeon Church, 5.9km), and the “Route of Unity” (Yakheyon Church to Samseongsan Holy Ground, 29.5km). The three routes were initially designated when Cardinal Andrew Yeom Soo-jung, Archbishop of Seoul, announced the “Pilgrimage Routes of the Archdiocese of Seoul” in September 2013, on the occasion of a visit of Pope Francis in 2014. 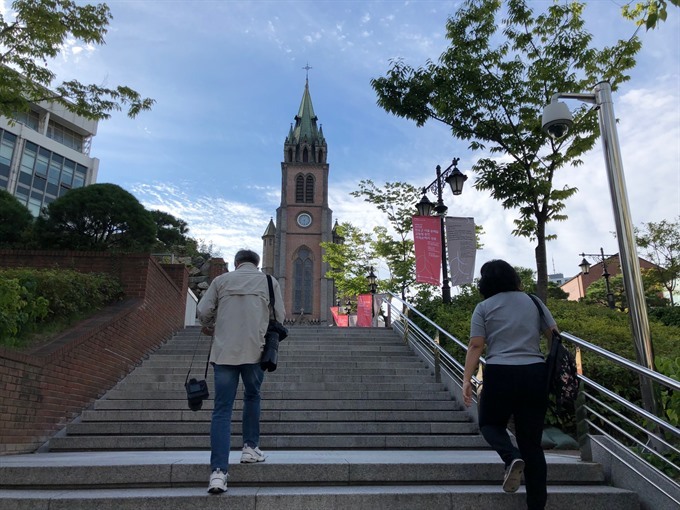 The Archdiocese of Seoul has collaborated with the Seoul Metropolitan Government to make the routes an international Catholic pilgrimage destination authorised by the Vatican. In order to develop the routes as a global tourist attraction, the Seoul Metropolitan Government has made efforts – it established a convenient walking environment and improved the guidance system, such as improving walking environment, installing stone floor signs as well as directional signs, and enhance the maintenance of signs marking cultural relics and historical sites, so that any Korean or foreign tourist can easily make access to the Pilgrimage Routes. On this occasion, the Seoul Metropolitan Government announced that it would newly develop a “guided tour of Seoul Pilgrimage Routes”, available from September 15, so that Korean and foreign tourists as well as Catholic believers can enjoy the pilgrimage route as a sightseeing course regardless of their religious compatibility. The guided tour is available in Korean, Chinese, Japanese and English languages. Addressing the ceremony, Archbishop Rino Fisichella, President of the Pontifical Council for the Promotion of the New Evangelisation, Roman Catholic Church, said today the whole Church has to face the challenge of transmitting the precious gift of faith to the men and women of our times and of opening up to the demands of the new evangelisation, notwithstanding the crises of the faith which impact many believers. “The witness of the Korean Martyrs nourishes our hope and certainty that the salvation worked by Jesus Christ is always relevant and capable of generating a style of life which is coherent with faith in His name,” he said. 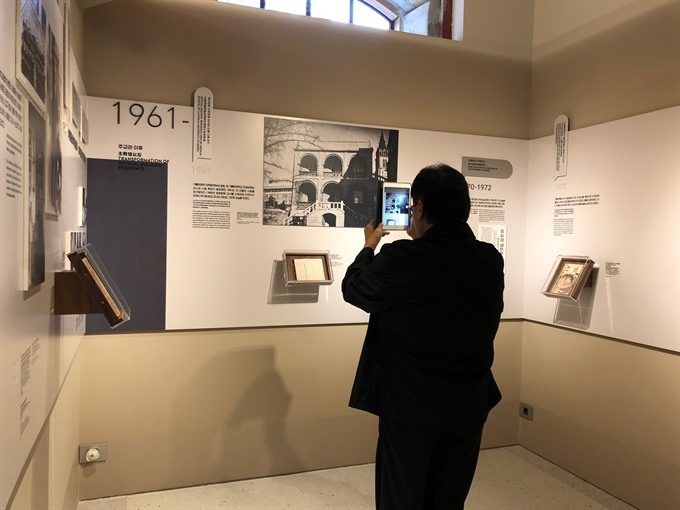 “We hope to emphasise our history regarding prosecution and martyrs in Korea in Joseon dynasty,” Andrew Chung, coordinator of Korean Martyrs Exaltation Committee, under the Archdiocese of Seoul told Việt Nam News. The Joseon dynasty (1392-1910), which was in power when Catholism arrived in the country in 1784, did not take kindly to the new religion and its teaching the word of God is more important than the King’s order. Fearful of the destabilisation of the social order, the new teaching was proscribed, and its followers were persecuted. During the 19th century, thousands of Catholics were killed – 103 of whom were canonized by Pope John Paul II in May 1984. “We expect more than 10,000 tourists will join the tours a year,” Kim Hyun Il, the chief of Strategic Business Team of Seoul Tourism Organisation confirmed with Việt Nam News. The newly launched course is divided into three routes that include “Bukchon Pilgrimage Route”, “Seosomun Pilgrimage Route”, and “Hangang Pilgrimage Route”. Each route is designed to naturally link the Catholic martyrs’ sites with nearby sightseeing spots. Most Reverend Nguyễn Văn Đệ, Bishop of Thái Bình Province in Việt Nam, who participated the ceremony, highly appreciated the initiation of the Seoul Metropolitan Government. “We, the Catholics respect ancestors, who sacrificed their lives to be loyal to their believe and handed it down to the next generations,” he said. Seoul government invited 57 people including religious leaders and youths of the Catholic Church from 14 Asian countries for the Korea Pilgrimage Week between September 9 and 14 to experience tourist attractions including the traditional markets in Seoul before eventually attending the proclamation ceremony held on Friday. The world’s leading travel and culture media, National Geographic, has featured a special article and a video emphasising the meaning of the authorisation by the Vatican for the first time in Asia as well as the characteristics of the Routes, starting from September 15. Related contents are exposed on the Facebook page of National Geographic Asia, which has 6.3 million followers. The Seoul Metropolitan Government has produced and distributed promotional materials such as guidebooks in Korean, English, Chinese and Japanese, and also developed applications to guide individual tourists.